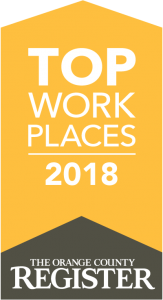 IRVINE, Calif. Dec. 7, 2018 – Ephesoft, Inc., an industry leader in enterprise content capture and data discovery solutions, has been awarded a 2018 Top Workplaces honor by the Orange County Register. The list is based on employee feedback gathered through a third-party survey administered by research partner Energage, LLC (formerly WorkplaceDynamics), a leading provider of technology-based employee engagement tools. The anonymous survey measures several aspects of workplace culture, including alignment, execution, and connection, just to name a few. The Ephesoft team is passionate about helping a wide array of customers and partners solve problems by identifying and extracting meaning from high-volume, high-value documents and data that is often trapped in unstructured formats like paper files, PDFs and emails. Examples of these documents exist throughout organizations and commonly include invoices, financial statements, account onboarding forms, claims, mortgages, contracts, mail, student transcripts, patient records or personnel files. Ephesoft’s patented AI-based supervised machine learning platform ingests and automatically classifies documents, then extracts, validates and exports the structured data into line of business applications. Ephesoft employs over 150 “builders and fixers” globally, including more than 50 at its Irvine headquarters, in a range of diverse positions such as management, business development, engineering, marketing, product management, finance, sales and technical operations. In addition to a generous benefits package, Ephesoft takes a “casual intensity” approach to business. Employees are encouraged to take a break from their desks to work from a beanbag, grab a game of Ping Pong or Foosball, and enjoy regular team lunches or join the daily “Ephesquatters” exercise group. Ephesoft also hosts several team building sessions such as its annual company BBQ, office trips to the movies, professional hockey games, bowling and multiple community involvement and volunteer opportunities. One of Ephesoft’s core values – teamwork makes the dream work – extends both inside the office and outside it, paving the path for customer success.